If you are suffering from chronic pain, consider Spinal Decompression. This non-invasive and non-surgical treatment works for the relief of neck, back and leg pain. Spinal Decompression has an 86 percent success rate and is FDA cleared. 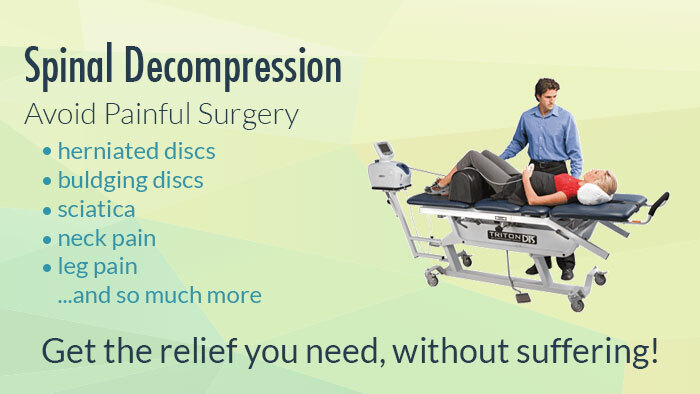 Spinal Decompression is a motorized traction option that gently stretches the spine. It works by taking the pressure off the discs and vertebrae. We cycle through “distraction” and “relaxation” phases and use positioning to isolate the problem. You remain clothed during Spinal Decompression therapy and each session lasts 30 to 45 minutes. We’ll fit you with a harness and Dr. Aboudib will operate the computer and table. Spinal Decompression produces “negative pressure” within the spinal discs (the padding between the vertebrae) so an injury can heal naturally. Companion treatments may include electrical stimulation, ultrasound, hot/cold therapy and cold laser. Spinal Decompression can help you avoid back surgery. If you have tried other treatments with no success, and are continuing to suffer back pain, consider Spinal Decompression before surgery. Dr. Tony has been using Spinal Decompression as an alternative treatment for the last 20 years with great success.